Peach made an amazing remix of Biohazard! Please check it out! Also, I just finished the flat colors for a new Aiko design! This design is a long-sleeved "winter" costume, or perhaps just for CVVC/VCV/rentan voicebanks, I really haven't decided yet. I'm in the process of otoing the bank and it should be released soon! Bi☣hazard in weekly Nico UTAran! Anniversaries, Bi☣hazard and English CVVC Release! Happy (belated) 5th birthday to Aiko, and happy (early) 5th anniversary to Project UTAU XYZ! I still have a few things in store for the rest of the week but I figured I might as well get all this done. Aiko's CVVC English is officially released! Also, CrusherP/Cien and I collaborated on another song and PV! It's my first PV but I plan to make many more in the future as I get used to After Effects. Many thanks to CircusP for his amazing mastering job! 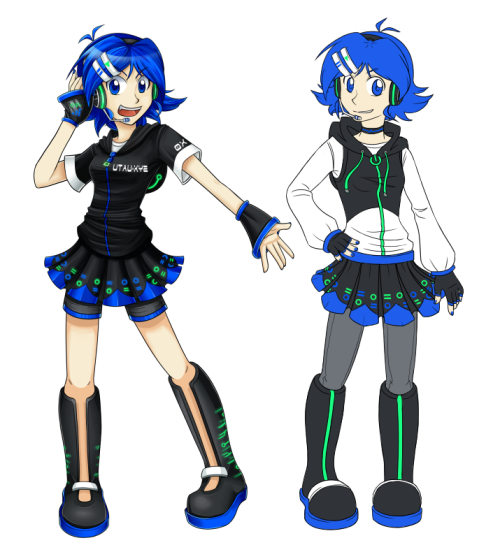 I'm a bit late in posting this to my personal UTAU blog, but UtaForum is currently in the middle of a Kickstarter campaign to raise funds to license new forum software (Xenforo) to power the fourth version of the site! We actually reached our goal in the first day of fundraising, but we are currently working on stretch goals which will allow us to obtain some extremely useful plugins for the forum. Rewards include a nifty forum badge for your profile for when the forum is upgraded, as well as voting tokens which will allow you to suggest and vote on which skins are developed for the new forum (beyond our Defoko standard theme). So please, if you can, do help us out!